Ruby Moon Hayes and her mother Dahlia have arrived in the small Vermont town that Dahlia had been born in. She remains quiet, hoping that people won't ask her what happened to her father, or why Dahlia was arrested after being in town for a week, or why she never has new clothes to wear. She doesn't want to make friends and wants to go back to where everything had been normal for her before. But Ahmad Saleem keeps trying to be her friend, and Ruby is drawn to the strange woman living in a shed and feeding the animals of the forest near her new home. 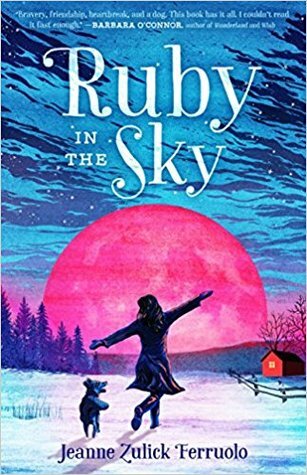 The elitists in town have terrible things to say about Ruby and her new friends, and she has to figure out what she wants out of life in this town. This is Ferruolo's first novel, and it's splendidly done. I was nearly in tears in several spots within the book, and it hit close to home in many spots. It's not that I have the same background as Ruby, but I can relate to being alone in school, not having friends, or being considered the weird kid. The longing and simultaneous fear of belonging is wonderfully portrayed, and it's something adults can empathize with, not just children or tweens. Ruby faces big emotional issues, and her silence in the beginning of the novel is never treated like a ploy to get out of trouble or doing assignments. I think this is a great book for adults and their children to both read and maybe discuss afterward. The experiences that all of the characters go through are fairly universal, and it would be wonderful for children that are shy and anxious to see that it's possible to push past that and that it's worth the risk. Great cover. Even though it's not a usual read for me, it sounds like one I could enjoy.